Situated in one of England’s finest and most historically significant cities, when the Queen Hotel opened on the 21st of April 1860 it was said to be “built in the Italian style upon a beautiful piece of ground with sumptuous furnishings, a beautiful garden and offering the quietest and most spacious first class Hotel in Chester”. Since then it has welcomed many prominent figures, including Lilly Langtry and Charles Dickens - the latter using the hotel as lodgings while appearing at a nearby theatre. Perhaps of most historic importance, however, is the hotel’s connection to Cecil Rhodes - many believe it was within the gardens that he considered his plans for Rhodesia (now Zimbabwe). 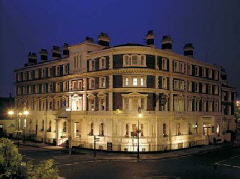 Today it offers well in excess of 200 guest rooms following the creation of “Kings at the Queen” from an adjacent building - it is, as such, one of the largest hotels in the northwest of England. Dining options are to be found in the Jubilee Restaurant, Albert Lounge and the Waiting Room Bar. Chester offers something for all age groups and interests, including one of the largest zoos in Europe which is famed for its conservation work. Historians will no doubt enjoy taking in some of the remnants of its time as a Roman “City of the Legion” (the place even has a partly excavated amphitheatre).